Our family loves to spend time together! Whether it's sharing meals, jumping on the trampoline or visiting with friends, we love whatever time we can get. We love "our adventures"! We recently moved from Florida to the country of central Pennsylvania. We went from visiting parks in the city to seeing cows behind our house. Our two girls are super sweet and active, but Ruth is still too small to pedal a bike on her own. And with her training wheels, four-year-old Claire can't keep up with us. Our family bike rides were a bit of a challenge. So when we discovered the Honey Bee by Burley we were thrilled! The girls can ride together while being pulled behind me or their dad. We both pulled the trailer to test the weight. I'm impressed that the Honey bee was so easy to pull. The perfect lightweight kids trailer. They love the fact that they are going along for the ride while laughing and playing in the cart. And they really get to be apart of the ride and enjoy the views. That huge for us! Through all of our rides, Claire and Ruth always tell us what they are seeing. "Look, mommy, the cows!" or "Wow Mommy, Daddy is beating you on the bike." haha or the countless giggles I always hear inside the Honey Bee! As their parents, we also love that they are safe in the Honey Bee. The 5-point harnesses are strong and the seats are comfortable for the girls. The stroller arm can act as a roll bar for added safety. We can even zip the trailer closed if the weather decides to take a turn for the worse. There's also storage in the back for a few toys that the girls can't leave behind. My husband is a stickler for durability, and this definitely hits the mark! 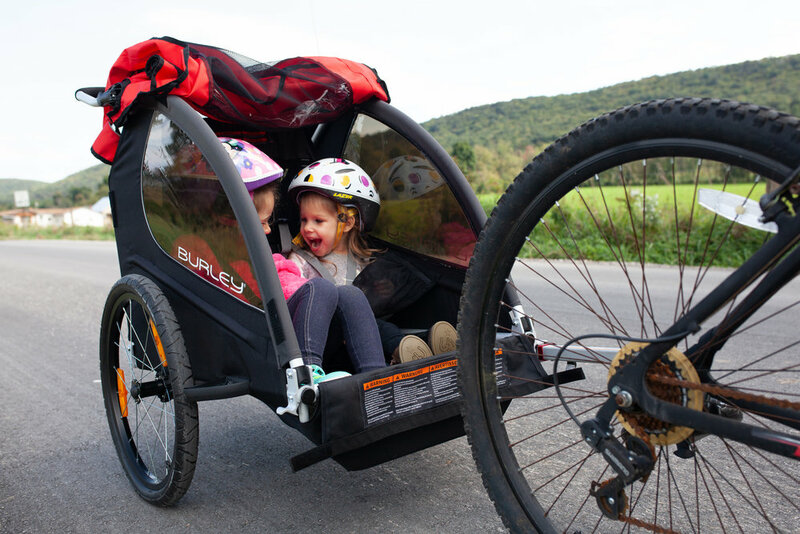 One great part about the Honey Bee is that the pull behind trailer can convert into a conventional stroller. It's so versatile, we were able to replace of one of our bigger items with this! It's also so convenient that it collapses for smaller storage when we aren't using it. We recommend the Honey Bee to all of our friends and family with small kids. We want to share something that we enjoy with them so that someday we can all go riding together. Off to our next Adventure! April, Claire (4), and Ruth (2).